The prestigious Padma Shri honour bestowed on innovator Uddhab Bharali and Prasanna Goswami Award to bio-tech scientist Dr. Pankaj Bharali brings jubilation to Lakhimpur. 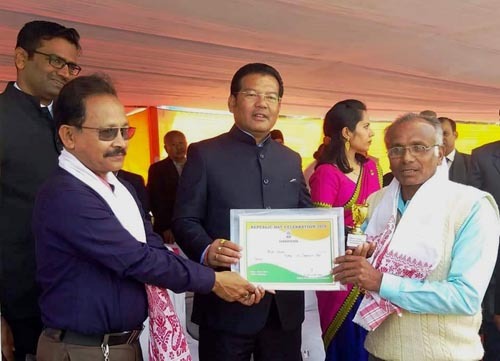 Padmashree awardee Uddhab Bharali was the guest of honour at the R-Day function in North Lakhimpur. From Hawajan to Gogamukh, from – Zengrai-Kekuri to Kakoi-Rajgarh Lakhimpur district was upbeat on the occasion of 70th Republic Day for the announcement of two prestigious honours to two of its sons. The Government of India announced the conferring of Padmashree to noted innovator Uddhab Bharali of North Lakhimpur and the Assam Science Society announced the Prasanna Goswami Award-2018 to bio-tech scientist Dr. Pankaj Bharali from Dhakuwakhona, making the entire district extremely proud to celebrate the day with great enthusiasm. The official function of the Republic Day was held in the playground of North Lakhimpur Govt. HS School playground where the national flag was unfurled by Naba Kumar Doley, minister for Rural Development and Panchayat, Cultural Affairs and Sports and Youth Affairs. He took the salute of the parade and inspected the guard of honour. Freedom fighters, veteran sports person Haladhar Duwarah and various personalities from different fields were felicitated on that occasion by Lakhimpur district administration at the R-Day function. Tableaux of various state departments like rural development and schemes like DDU-GKY, PMAY were displayed during the parade of the Republic Day function in North Lakhimpur. The R-Day function was also attended by Lakhimpur Deputy Commissioner Dr.Jeevan B and Superintendent of Police Harekrishna Nath. Various organizations also organized different programmes on the occasion of Republic Day at North Lakhimpur. The Lakhimpur Hahila Unnayan Samiti distributed light food and refreshment among the patients of North Lakhimpur Civil Hospital on the occasion of the 70th Republic Day of the country. A team of the organization led by its president Tazwara Sultana distributed food items at the hospital along with the Joint Director of Health, Lakhimpur Dr. Haprpal Singh Suri.